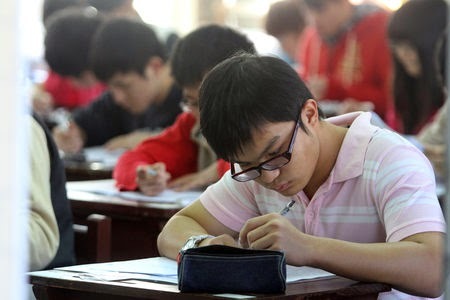 As the exam week draws near some of us are thinking as to how we can alleviate the massive cheating in the class. You can do to your students what the teacher at Kasetsart University did during the exam last year, putting horse-like or anti-cheating blinkers to each students’ head. It created a stir and may possibly create one again if you do it, but if you can’t think of any then do it as a last resort. They said it’s natural for students to copy during exam. It’s like human nature. We ask or seek help whenever we feel vulnerable and weak. Others may differ but I personally think there’s a truth in it. I was one of the students belonging to the top three sections in high school. Competition was high and most were trying to ace the first spot. At the time I wasn’t fancying of being included on the list of top 20 students, let alone on the top 10. It was like a trip to the moon and back. It was like hitting a bird with no stone. My grades were flying but not with so much colors. Being able to graduate with grades that won’t make my mom weep blood was enough for me. But let me tell you about my teacher who did something unusual during our final exam in physics. Before handing us the test papers, she asked us to sit wherever we feel comfortable. I immediately occupied the seat in the middle of two people who were both good in the subject (Why wouldn’t I? I can do a quick glimpse from time to time on both sides). Then she gave the test (single page) to the people in the first row. After a few seconds, she gave another page to the people in the second row (my row), and down to the third and last rows. She asked us to write the names of people sitting on all sides (right, left, in front of and behind). It was weird but we did it still. While I was doing what she asked, I noticed that the paper I was holding bore a number 2 on top. I thought she made a mistake but I ignored it at once. “Can I have page number 1, please?,”blurted by a friend on the last row. We later realized that each row was holding a different page of the test. My eyes and mouth opened wide. How can I glance at the people sitting both on my left and right? To put it bluntly, I planned to cheat to simply pass. To get correct answers on questions I have no idea about. At the end of the day though, it was our teacher who cheated on us. At least that how we all felt. So if you are still struggling of what to do to your class, perhaps you can follow her lead. I do it to my students whenever they have an exam, and I couldn’t agree more how effective it is.